ShowerPot effortlessly and artfully rescues some of the water we waste, for use in gardening, cooking and even drinking. Find out how you can help conserve water. James Peters is the award-winning artist, innovator and entrepreneur who created ShowerPot. How much water is wasted while you wait for your shower to warm up? On average, 2 gallons! The average five minute shower statistically uses 10-25 gallons (USEPA). 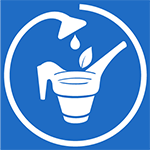 With only 50% participation, ShowerPot™ will rescue the equivalent of 2 billion bottles of water, every day! Government Officials: Learn how to get ShowerPot for every residence. 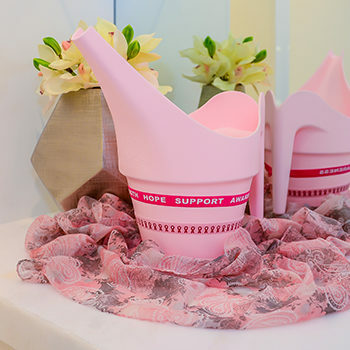 ShowerPot comes in several colors such as breast cancer awareness pink. Support your cause! 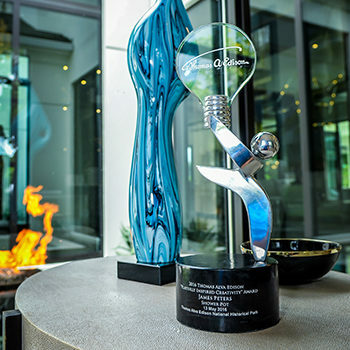 ShowerPot is the global award winner of the Thomas Edison Innovation Award for 2016. "ShowerPot is an elegant reminder to conserve potable water — one of our most valuable resources. 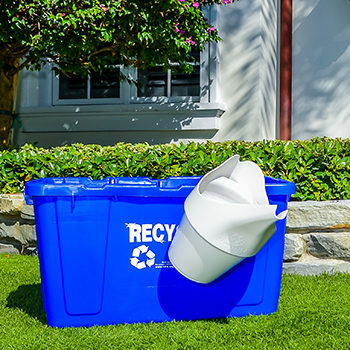 If this were used widely, like recycling bins, it could help start the conversation about conservation." "I was noticing it, I was wondering what it was? I think it's fantastic! Congratulations, good luck." Email us or call (561) 929-7773 for more information.